Prompted by the case of a small boy who ought to have muscular dystrophy but doesn't, Japanese researchers have discovered a small molecule that they hope will treat the disease. Duchenne muscular dystrophy (DMD) is caused by mutations that prevent the production of the protein dystrophin. A lot of work is being done to promote the 'skipping' of these mutations so that dystrophin production can proceed, but up until now most work has relied on genetic approaches. Masatoshi Hagiwara at Kyoto University, Japan, found a boy with a mutation that should have led to muscle wasting. 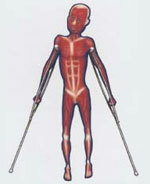 Instead he had normal, healthy muscle fibres. This suggested that he was still producing dystrophin, so the team investigated how this could be possible. The group found that the boy had a mutation, which changed the codon for one amino acid into a stop codon, that ensured correct synthesis of dystrophin. Realising that small molecules might promote this effect, the team screened a library of compounds and showed that a drug they'd investigated previously, called TG003, promotes skipping of exon 31 where the mutation exists. 'TG003 is a benzothiol, which we originally investigated in 2004,' says Hagiwara. Originally investigated as a kinase suppressor, TG003 is the first small molecule that's been shown to improve dystrophin production in vitro. 'It's important to realise that in some cases splicing can be influenced, specifically by small molecules,' says Gert-Jan van Ommen who researches muscular dystrophy at the Leiden University Medical Centre in the Netherlands. But while van Ommen says that every patient helped is a good thing, he adds that 'very few' patients are likely to respond to the new drug. With genetic approaches already in Phase II and III clinical trials, van Ommen, who has worked with Prosensa and GlaxoSmithKline on an antisense nucleotide, says that this technology is a much better approach. But Hagiwara says he's going to pursue TG003 and will be looking for a sponsor for a Phase I trial.